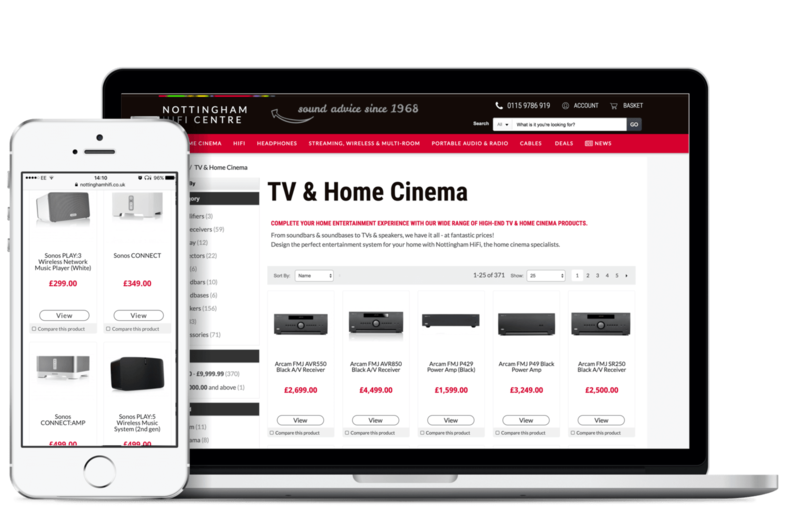 Nottingham HiFi are an established HiFi and audio shop with a larger sister brand. We approached them with the concept that we could take an almost unknown brand and create a better conversion rate through user experience and design. Chasing down a company with an 11 year head start in a competitive marketplace was going to be difficult but it’s the kind of challenge we thrive on. Starting from a bricks and mortar shop and a single domain name we set about planning the conversion into a digital space. Utilising an off the shelf tried and tested ecommerce platform was going to shortcut the development time. Our development team have combined decades of development experience in the ecommerce arena which was essential in choosing a system with all of the features that would be required. After researching the market we settled on a free ecommerce platform. Using our design team’s internal knowledge of UX & UI best practices and design theory to ensure our product hit the mark with users. Finally a relatively unknown brand was going to need a little help to be found in the search engines, so a online marketing plan including SEO and PPC was going to be essential and ongoing. High end hifis require high end design. Taking this approach we introduced expanses of white space and large product imagery. Focussing on the established brand colour and supporting this with deep wooden browns was the beginning of the online brand. This sat well in a market of crowded and cluttered sites. 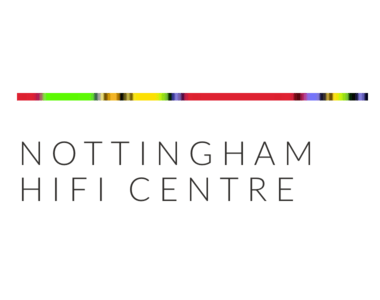 Nottingham HiFi came to us as a new brand in a competitive industry. This posed a challenge as the aim was to show the brand amongst those already well-established in the field. Through continuous contact, on-site optimisation of product pages and a focus on blog posts, we were able to attain a positive position that allowed organic sales from search to grow over time. 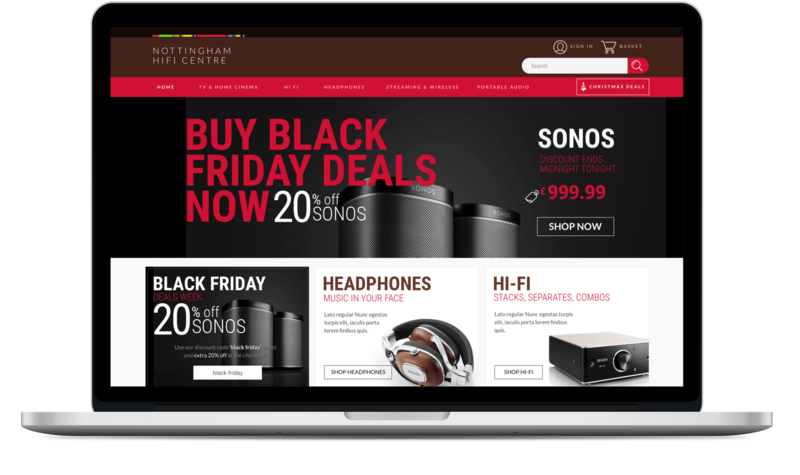 An organised eCommerce PPC strategy aimed to grow Nottingham HiFi’s sales, while providing support to the in-store representatives through the use of sales leads, allowed us to obtain positive online growth but still providing custom to the storefront. Optimisation of the product feed, on-page content and targeted search ads enabled us to build brand awareness against larger retailers, bringing about positive feedback from customers in a populated retail industry. From a standing start and with a year to prove it’s worth, we managed to create a better conversion rate on our site than the sister company. Additionally increased footfall in the store attributed to the increased awareness of the site in major search engines.